Bed bugs in Las Vegas are much more common than many would imagine. While they have been the focus of a few news stories and the occasional blog, bed bugs are something that many don’t talk about. Of course, hotels and other businesses are worried about tarnishing their reputations in this vacation fueled economy. Innovative Pest Management provides fast and effective bed bug treatment to homeowners and businesses alike. Proper treatment of bed bugs will take a minimum of three visits from a qualified pest control specialist. Bed bug eggs take approximately 10 days to hatch. While you can treat the existing bed bugs on the first visit, 7-10 days later eggs are due to hatch and you now have those to deal with. Anyone claiming to cure bedbugs in a single visit is likely just out for a quick buck. This is why follow up visits are imperative for proper bed bug treatment. Perhaps 30 years ago, bed bugs could have been considered a very uncommon pest to be dealing with in one’s home. Increased regulation of insecticides in developing countries has lead to a resurgence of bed bugs like never before. With international flights from nearly every corner of the globe landing in Las Vegas on a daily basis, seemingly distant bugs now have a non-stop flight to your backyard or even bedroom. Unfortunately bed bugs have found Las Vegas beds to be one of their favorite vacation spots and many have decided to stay. From single family homes, to high rise 5 star hotel rooms no dwelling is exempt from the possibility of bed bugs. With full grown beg bugs measuring in at only 6mm in length, they can be easily and unknowingly be transported anywhere on a piece of luggage, shoe, or even a pant leg. Younger bed bugs can be almost invisible to the naked eye. Once they have had their first blood meal they get their dark red color. 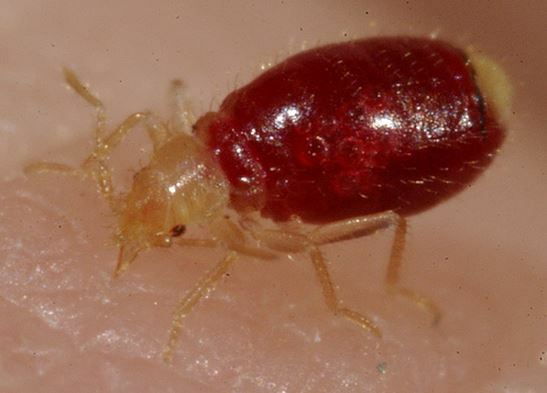 If you spot a bed bug and it has a red/brownish color, that is likely because it drank your blood. Yuck!